The name is French, but it refers to Macedonia (ancient Greece). Originally that was a mass of small kingdoms that were finally united under Phillipos II and his son Alexander the Great in the fourth century bC. Since late in the eighteenth century one used the name macédoine for a cold mixed dish of fruit (in sugar syrup) or of boiled vegetables, the small pieces of diverse fruit or vegetables representing the manifold kingdomes of ancient Macedonia. Nowadays you can buy macédoine of fruit and of vegetables in supermarkets, canned or in glass jars. But you can’s just pick any can of ‘mixed vegetables’. Officially, Macédoine must contain at least four different vegetables (peas, carrots, turnips, potatoes, stringless beans, celery, white beans). So there is no sweet corn or kidney bean in Macédoine. According to my Larousse, the vegetables are to be diced in 4×4 mm cubes exactly. Recipe: Russian Salad. When you buy fish it is almost always cleaned. Mackerel and sardines however still have their entrails (at least in the Netherlands). The fismonger will draw the fish for you, or you have to do this yourself in your kitchen. When you do, make sure you do this immediately. The entrails of a mackerel deteriorate quickly. If you have bought your fish in the morning and wait with disemboweling it until just before you want to prepare it for dinner, chances are you unpack an exploded mackerel, or a fish with a repulsively soft belly. Recipe: Broiled fish with three sauces. Wine from the Portuguese island Madeira, in the Atlantic ocean. gelegen in de Atlantische Oceaan, ten Westen van de Straat van Gibraltar en ten Noorden van de Canrische eilanden. From the sixteenth century onward extra alcohol was added to the wine to make it less perishable during trans-Atlantic transportation. This as well as the prolonged exposure to high temperatures during transport, resulted in the unique taste of Madeira wine. Recipe: Traditional game sauce. In 1886, the Swiss Julius Maggi delevoped a soy sauce-like herbal seasoning based on the meal of beans and wheat, to compete with the meat extract of Liebifg. The taste is much like that of lovage (Levisticum officinale). In Dutch lovage is now even called maggikruid (Maggi herb). But lovage is not present among the ingredients of the seasoning. I am not going to repeat the history of Maggi, just visit the German wikipedia the subjects Maggi and Maggi-Würze. In this article in the Chicago-Tribune, author Kevin Pang mentions that Maggi seasoning exists in many varieties for specific regions. Recipes: Roman tuna, Macaroni with tomatoes, Macaroni Pie. Wild ducks are smaller than the white domesticated ones, they weigh around 2 pounds, tame ducks weigh 5 to 8 pounds. Mallards also have a much lower percentage of fat. The hunting season is from august to february, but mallards are at their best in september, before the cold sets in. However, wild duck can be bought frozen all year. Always check your mallard for pellets before preparing it. In the Netherlands you can also buy kooieenden. According to my lexicon these are decoy ducks in English. See decoy in Wikipedia. Ducks that are caught in a decoy are not shot but killed by breaking their neck, so they won’t have pellets and contusions. Recipe: Mallard with onion sauce. This is the concentrated juice of the North-American sugar maple tree (Acer saccharum) or the black maple tree (Acer nigrum). The taste of real, pure maple syrup is more complex and interesting than that of fully refined sugar. But pure maple syrup is expensive, so there are many adulterated versions. Recipe: Cranberry-walnutbread. Look, calendula! That is the cream to put on burns and grazes! And indeed, Calendula officinalis is an ingredient in all kinds of medical and cosmetical ointments for the skin. Dishonest salesmen sold the bright yellow or orange petals as true saffron. 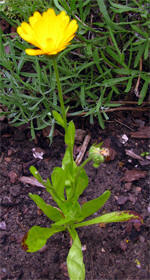 Marigolds are annual herbs, but if you leave it be (and don’t pick all the flowers), it will spread easily. Recipe: Garden Salad. In Latin Origanum majorana. The kitchen herb oregano is wild marjoram, Origanum vulgare. Marjoram is the cultivated variety, but very old, it is already used in classical Greek and Roman kitchens. In a temperate climate like the Netherlands marjoram is an annual herb, it has trouble surviving the winter. Oregano is stronger, but tastes better in a warmer climate. Recipe: Jacobin sops. Sweet Italian wine from the isle Sicily. Often drunk as aperitive. See Wikipedia for more information. Recipe: Zabaglione. The fruit of a small tree (the Mespilus germanica) that is related to apples. The fruit resembles an apple, but what is at the core of the apple, is visible at the underside of the medlar. They are, even when fully ripened, unedible, they are too firm. 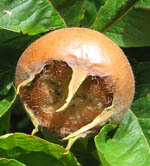 The saying “rotten as a medlar” comes from the fact that the fruit can not be eaten before it is brown and soft through fermentation. And even then many people are repulsed by the taste. Medlars used to be added to must to enhance taste and durability, which is probably also why Vorsselman advizes added medlars to verjuice. 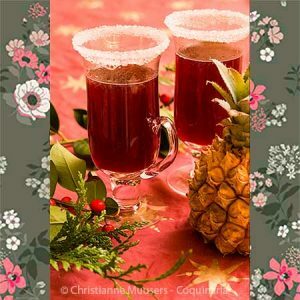 Recipe: Verjuice. A grain from the Middle East or Southeast Asia (Panicum, several varieties). It grows only in warm climates, and is resistant to draught. That is why it is an important food in Africa. Compared to other grains, millet is rich in minerals. Recipe: Roman bread. A flavour-enhancer that is used in Asia, but also in the food-processing industry. Some people are allergic to it. Use it sparingly, or better is not to use it at all. Recipe: Chinese tomatoe soup. In English this mushroom is called St.George’s mushroom, the scientific name is Calocybe gambosa or Tricholoma georgii. It grows in fairy rings, from the end of April to the beginning of June, and is associated with Saint George because 23 April (St. George‘s day, you know, the one with the dragon) is when the mushrooms first show their little hoods. 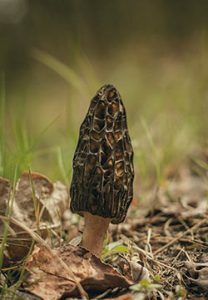 This makes it one of the earliest edible mushrooms that can be gathered after winter. Recipe: Jacobin pottage. A fresh cheese made from the milk of buffalos. Another buffalo cheese is Provatura. The difference between Mozarella and Provatura is mainly the place of origin: Provatura cheese is made in the vicinity of Rome, Mozarella is produced near Naples. Originally these cheeses were made from buffalo milk, but nowadays they are mostly made from cow’s milk. There simply aren’t enough buffalos to provide all the milk needed for the production of these cheeses! Just use ordinary Mozarella or Provatura if you can’t get cheese from buffalo milk. Recipes: Panunto, Royal white tourt. spicy sauce made from fermented grain, used in medieval Arab recipes. As a substitute, soy sauce is often recommended. In my opinion taotjo (fermented soy bean paste) is a better substitute. The recipe. 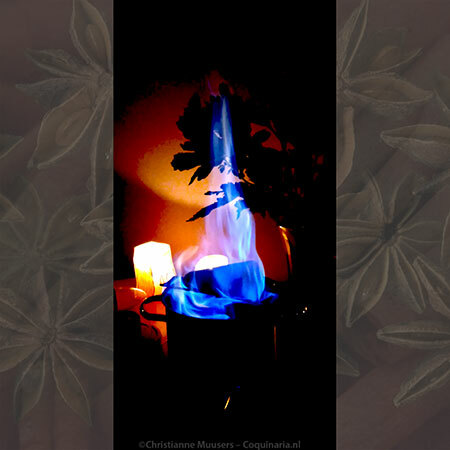 Aromatic substance from animal origin that is now used mainly in perfumes and fragrances. The Arab cuisine made use of it in the kitchen during the Middle Ages as a spice. In Europe musk was in culinary use during the seventeenth and eighteenth centuries. It is practically impossible to buy musk, and that is a good thing. 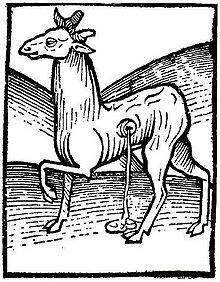 Musk is obtained by killing the musk deer, which is now almost extinct. So the industry now mainly uses synthetic musk, and the kitchen can do well without it. This has always been a popular condiment. Mustard is made from the seeds of several species of the brassica-family (cabbage). From some varieties the leaves can be eaten, and the seeds not only serve to make mustard, but can also be pressed to yield a culinary oil, or distilled to make a medicinal oil. There are black, white and brown mustard seeds (from Brassica nigra, Sinapis alba en Brassica juncea), each with their own specific properties. The first to are indigenous to Europe, the brown mustard has its origins in Asia. Make your own French mustard. Recipes: Mallard with onion sauce, Souppe de moustarde, Tuna with mustard crust, Red Mustard. White mustard seeds (Sinapis alba) are easier to find in the shops than black ones (Brassica nigra). White seeds are also softer, and can be crushed more easily. There is a difference in taste: white seeds are spicy, black seeds are really hot. In the Middle Ages both kinds of seeds were used to make mustard. Because Brassica nigra is difficult to harvest by machines, it is less and less cultivated nowadays. The asian Brassica juncea has replaced black mustard seeds in the production of dark mustard. Recipe: French mustard, Red Mustard.